Don’t be alarmed. A fan brought this to my attention (thanks Michael). If you Googled me or my show (and why would anyone do that?) you may see this. I can assure you that Matt, the web guy, is working around the clock to ensure the safety of the site. We’re currently trying to get this warning removed from all search engines and get “verified” basically. If you do encounter a problem with the site be sure to contact myself or Matt ASAP. Current Episodes I’m working on. Mystery Science Theater 3000 Tribute – I hope to get this one done before June is over. 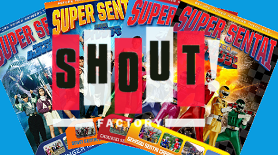 Chouriki Sentai Ohranger – Got the Shout set and transferred it, script is written and I’m in the process of filming the skits. Kamen Rider Faiz: Paradise Lost – Planning to introduce a couple new things in this review, and maybe a new character. 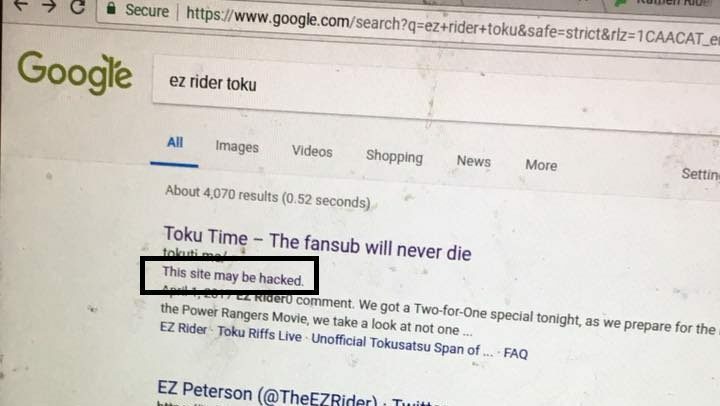 I may be taking a break from Tokuween this year. Not that I don’t like doing it but the Metallix review last year did not turn out as good as I had hoped due to technical and personal reasons. It just felt sloppy and I think I need to take a year off from that to think of something really good. But I want to hear suggestions. What do you want to see more of? Something else/All of the above? I have found a few new clips, mostly from the newer Rider/Sentai shows. But I still need YOUR help to find weird clips. You, the Toku Faithful, who go back and watch older shows. If you find a clip please do not hesitate to e-mail or tweet it to me. I will credit you on Viewer’s Choice. I’ve decided to put What’s Happening in the World of Tokusatsu on hold indefinitely given YouTube’s copyright BS. I’m at my wit’s end with that site. I’ve all but given up on trying to do any kind of show on there. I tried it their way with WHITWOT, no video, no music, and I STILL get tagged and flagged for just pictures. I’ve had enough. It’s like arguing with a brick wall. I may post some funny gag videos on YouTube but don’t expect much there anytime soon. If you want to see a much better toku news show I recommend Tokusatsu Network’s Weekly News Round-Up, which can be found here. This is going to be a busy year for me convention-wise. I’m going to three conventions this year, that’s a new personal record. Japan World Heroes: Aug 26-27th Pasadena, CA. Morphinominal Expo: Sept 2-3rd San Antonio, TX. RangerStop 5: Nov 3-5th. Orlando, FL. As usual, photos and autographs from Yours Truly are free. I’ll be joined by at least one or more of my RVT brothers for each con. Hope to see you there. The Monthly Draw continues as planned. I’ve had to stop buying prizes because a few patrons did not claim one when their names were drawn. So I’m having an “Everything Must Go” draw. 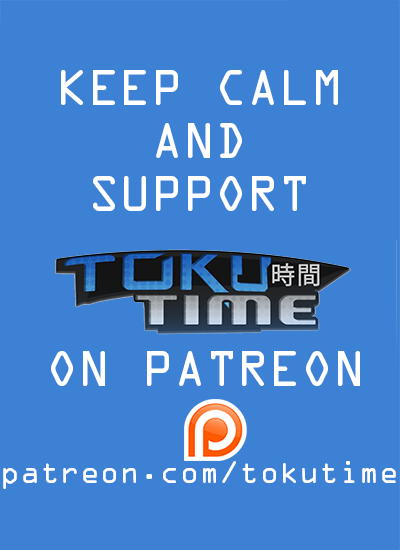 But if you aren’t a patron keep in mind that it only takes $1 a month to enter to win some cool toku stuff. Speaking of which, the first episode of a special Riff of an old dubbed toku series is in post-production. 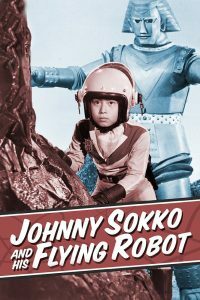 In association with the Toku Riffs Live crew, we’re calling this show Toku Riffs (Almost) Live, we’ll be riffing Johnny Sokko and his Flying Robot. The first episode features myself, Shades, and Matty Jay. We may switch out members for future episodes though. HUGE thanks to Mikshel for getting me this box set. I remembered this show as a kid and after seeing it again on the Comet cable channel I knew I wanted to riff it. Patrons will get the riff for free but the rest of you will get a chance to purchase the .mp3 for $1.99 and sync it up to the episode for your viewing pleasure (Episode not included. You’re on your own there). We’re still catching up with Ex-Aid and Kyuranger. 2 and 2. We also just started watching Orb again. We’re still pondering what Classics to do and when to reveal them but we’ve got to get the new stuff over and done with. We still plan to do Kyoryuger/Dino Force Brave at some point. Make sure to check our archives on YouTube to see where we are so you can be prepared every Sunday for the hilarity. The Ninja Steel hiatus is still in effect so we’re sticking to classic Power Rangers episodes for the time being. We’ve still got plenty of news to talk about so make sure to join us on Thursday for that. We’re getting closer to the 100th review, Toku Faithful. I won’t say what it is but there will be build-up to it. For everyone confused about this I want to make it very clear. PARTS ARE NOT EPISODES. If a review is cut into parts, that is not another episode. It merely means I had to condense the review into pieces but those are all part of the same episode. I know some of you already think I’m well past 100 episodes but I’m not. I’ve already written the storyline for the review but have not begun scripting the show I’ll be looking at. There may be cameos, there may be crossovers, there may be conclusions. You never know. Well that’s all I’ve got to report on. If you want to see more sit-reps let me know and don’t forget to comment if you have anything to say. The fansub will never die. Why not just host WITWOT on Vid.Me? Vid.me does not offer monetization, which I do for WHITWOT to make some spare change. Once they do maybe I’ll consider it. I want it to come back, so would you please consider even without monetisation? Will you please think of other options for WITWOT? I think the new character is going to be a new Imagin. could you do kamen rider kiva for next tokuween?